Today we will take a brief look at some of the idols of the heart, what the Bible calls “other gods” that work to crowd Jesus out of our lives. I know the words idol and idolatry often conjure up pictures of primitive people worshiping all sorts of things except the One true God to whom they should be bowing. But make no mistake, in our contemporary and prosperous society we bow down to a great many things other than God. We Americans find ourselves living out the truth pronounced about us by Alexis de Tocqueville: “There is a strange melancholy that haunts the inhabitants in the midst of abundance.” There will always be a “strange melancholy” that haunts those who look to, chase after, and attempt to find satisfaction, meaning, and purpose in anything other than God. So . . . have you made anything in your own life more important than Jesus? If you have you have bowed down to an idol, that idol will not only rule your heart, it will shape your life. It will enslave you to it and have you live for it. We all know about the power contained in these “other gods” from personal experience, because whenever we failed to attain them (or lost them after we had attained them), life simply did not seem worth living. And remember, idols can be good things, really good things that God gives to us as blessings – family, marriage, relationships, children, work, finances, health, recreation, hobbies, church service, etc. – but they have become ultimate things . . . which makes them bad things. Throughout years of pastoral counseling, it is not uncommon to meet people who were in mad pursuit of really good things that turned into supreme things. Sure, there were those who were chasing after some bad stuff. But, for the most part, the greater the good that was found in the “thing,” the more passionately they pursued it. Why? They falsely assumed that it would meet them in their place of deepest need, satisfying their drive for meaning, purpose, and significance. God will tolerate no rival, nor should He, and He will always take us to the place where these idols leave us wanting, wishing, and often wailing. This verse puts our “other gods” in their proper perspective, doesn’t it? Every promise our idols make leaves us wanting. They simply cannot deliver and never were meant to deliver on their promises. They promise happiness and deliver despair. They promise contentment and deliver restlessness. They promise freedom and deliver shackles. They promise fulfillment and deliver emptiness. They promise love and deliver loneliness. Only Jesus can deliver – and does deliver – every single time on every single promise. Only Jesus can save us from ourselves and our natural tendency to run toward things other than Him, and He does it day after day . . . week after week . . . month after month . . . and year after year. Whatever captures your heart controls your hope, and whatever controls your hope is your functional savior. If you are hoping to be accepted by the “in” crowd, your priority in life has become your functional savior and you will sacrifice everything in order to attain it. If you are hoping for the body you had at 20, your self-image is your functional savior and you will sacrifice everything in order to attain it. So . . . let me ask you again: who or what is the Lord of your life? The One True God, who came down from heaven and went up on a cross for you, is the only God worth bowing to. I have a word of great comfort for you today. Do you find yourself in a season of difficulty? Are the storm winds blowing your way? Is God disciplining and/or pruning you for greater growth? The writer of Hebrews tells us that, “No discipline seems pleasant at the time but painful. Later on, however, it produces a harvest of righteousness and peace for those who have been trained by it” (Hebrews 12:11, emphasis added). LATER ON, HOWEVER . . . after physical death we find eternal life! Regardless of what trial we are currently experiencing, God promises to bring us to the other side of it. When God says, “Later on, however,” He is telling us that the best is yet to come. All may seem lost today; “Later on, however,” we will experience victory. We know this to be true because we know the One who said it is Truth. The One who says, “Later on, however,” superintends all of life, regardless of how dark and dismal the day becomes. Not a bird falls to the ground apart from His will (Matthew 10:29). When we forget this truth we become practical agnostics, living lives of hopelessness and helplessness. “Later on, however” is the fuel for forward motion regardless of the cost or circumstance. What are you facing today? Struggles in school? Obstacles at the office? Miscommunication in your marriage? Disappointment in your dating life? If Jesus is on the throne of your life, count it all joy, because “later on” every trial, every disappointment will produce a harvest of deep peace and sweet rest. Henri Nouwen rightly observed, “Those who dream of better things are not those who hate what is now, but who love the present enough to seek its transformation.” To be sure, life is hard on this side of heaven. But Jesus is in the process of transforming everything and making all things new, and that includes you. We are in the middle of “March Madness.” That time of the year when everybody follows a favorite college team through the NCAA Post-Season Tournament. One thing this should teach us is that regardless of how talented one or more players are on a given team, it is the total team effort that will take you on the road to the Final Four. This is also true regarding our position in Christ. Every Christian is saved individually by grace through faith in the Lord Jesus Christ. But in addition to that, every individual Christian has been saved from isolation to community. What a wonderful picture we have painted for us as His church – all members of the body of Christ! And not only are we members of His body, we actually belong to each other. We truly are our “brother’s keeper” (Genesis 4:9). The “one body” speaks of our unity. The “many members” speaks of our diversity. And the “belonging to all the others” speaks of our interdependency. We each need each other! There is no such thing as a self-sufficient saint. Notice this truth too: there is no “I” in the word TEAM, because the good of the all always outweighs the good of the one. What a great privilege we have been given by God! To be on His team, pouring ourselves out for His glory and the good of others . . . expanding the cause of His kingdom rather than advancing our own agenda. This is the Christian life. This is living a life of meaning, significance, and purpose. And it can only be lived out in community. Christianity is indeed a team sport. How well have you been playing it lately? Having been in the ministry for many years, I often ask young people what their favorite Bible verse is. Many quickly seize on the shortest verse in the Bible, “Jesus wept” (John 11:35). Perhaps it is the easiest one to remember! Well, today, I’d like to discuss this verse, plus another example of the witness of His weeping. John’s two-word account of Jesus weeping might seem a bit strange to those who know the context of the story in which it falls. It was the occasion of the death of Christ’s friend Lazarus. Jesus had received word that Lazarus was sick, yet He delayed two days before going to him. Jesus explained to His disciples that He planned to raise Lazarus from the dead in order to glorify the power of God. As He stood outside Lazarus’ tomb, Jesus knew that in mere moments He would raise His beloved friend from the dead. And yet He wept. Why? I believe it was to show us just how much our Lord hates sin. It is sin that has brought on death and Jesus had come to atone for that sin . . . both with His sinless life and His sacrificial death on the cross. And yet, in spite of His perfect, eternal knowledge of His plan to redeem the world, Jesus wept, giving stark witness to just how much God is grieved by our sin. As Jesus was approaching Jerusalem during His Passion week, He wept again. The compassion of the Creator of the universe is simply striking! The depth of His care and concern for fallen, sinful, broken people is overwhelming. Jesus weeps because He knows how sin has wrecked everything that was good. Nothing has been left untouched by the hideous blight of sin. Creation itself groans to be redeemed by our Lord and Savior (Romans 8:22). The hearts of God’s people had grown cold, callused, and closed – resistant to the Good News of the Gospel Jesus was preaching. The Pharisees and religious leaders had become “blind guides” (Matthew 23:24) to the things of God. The apostle Paul explained it this way: “The god of this age has blinded the minds of unbelievers, so that they cannot see the light of the gospel of the glory of Christ, who is the image of God.” (2 Corinthians 4:4). Jesus wept – at least twice that we know of – as He surveyed the terrible mess we have made of His world. Why? Because Jesus has a heart that overflows with compassion for all people, including “blind guides” like you and me. 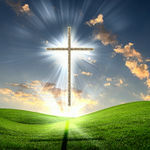 That is what we all are before Jesus shows up and gives supernatural sight to the blind, raising us from death to life. Jesus is the One the prophet Isaiah spoke about who would come and “proclaim peace and salvation to Zion” (Isaiah 52:7). Do you know this peace? Have you received it by grace, through faith in the only One who can meet you in your place of deepest need? The witness of the weeping of our Lord and Savior should be a source of great encouragement to you today. Jesus cares about you deeply. He knows what sin has done in your life. Jesus loves you intimately. Jesus forgives you completely and continually. Remember, on His way into Jerusalem, He knew what awaited Him on Mount Calvary, yet He refused to stop one step short of going all the way to the cross for you and all those who transfer their trust to Him. In Jesus’ day, the hours of the day were counted from the time of sunrise. The sixth hour would be noon or midday, and the ninth hour would be 3 p.m. The Scriptures tell us that at midday it became as midnight; darkness covered the whole land. Having endured the beatings, the crown of thorns, and the nine-inch nails driven through His feet and hands, our Lord hung spread-eagled on a rough, wooden cross. Jesus now entered into the most horrific aspect of His crucifixion. It can easily be missed, because it is, in a word, unfathomable. The darkness mentioned here in the Scriptures reflects the Father removing His fellowship from His precious Son. From all eternity, the Father, Son, and Holy Spirit had existed in a perfect relationship of fellowship, love, and glory – until now! It was one thing to suffer at the hands of men who were used of God to punish the sinless Savior for the deeds of sinners like you and me; but now the Holy Father unleashed His unimaginable wrath and judgment on His beloved Son, who was hanging on the cross, bleeding and dying, to pay the penalty for our sins. Because God’s eyes are too pure to look upon evil (Habakkuk 1:13), He turned his back on Jesus, who had become sin on our behalf so that in Him we might become the righteousness of God (2 Corinthians 5:21). The physical pain Jesus endured during His crucifixion – we get our English word “excruciating” from the word for “crucify” – is truly difficult for most of us to imagine. That shuddering, gasping agony is reduced to the level of a mosquito bite, however, compared to the shattering supernatural anguish He experienced when He suffered something no Christian will ever have to experience: being forsaken of the Father. The terrifying darkness at the sixth hour was not the result of some natural phenomena, such as an eclipse or dust storm; it was a supernatural sign from God to the watching world. At the time when the sun would normally be at its brightest, midday became as midnight, and God judged the One who had never known sin in the place of those who had known only sin since Adam and Eve’s catastrophic fall in the Garden of Eden. Luke’s Gospel describes the darkness: “The sun was darkened” (Luke 23:45). In the original Greek text, we would read this statement as “the sun failing.” The One who called the world into existence and hung it on nothing, who spoke light into existence, sent this supernatural darkness so that we might understand the blackness of our sin and the damage it has caused. Darkness in the Scriptures is often associated with judgment against sin and wickedness. The prophets spoke often of God’s judgment against sin that would be demonstrated in the form of darkness. Who can forget the darkness God sent to cover the land of Egypt as judgment against Pharaoh when he refused to let the Israelites go (Exodus 10:22-23)? Darkness is also used as a description of hell: “Cast the worthless servant into the outer darkness. In that place there will be weeping and gnashing of teeth” (Matthew 25:30). For three solid hours, from the sixth to the ninth hour, God poured out His cup of wrath and judgment on His precious Son, who was paying a debt of sin He did not owe for those who owed it but could not pay. Jesus hung on that cruel cross, forsaken by His Father, and endured the unthinkable darkness of sin and hell. The light of eternal love between the Father and the Son had been utterly extinguished. On that day, when Jesus willingly took our place as our Substitute . . . our Savior. He experienced the “outer darkness” that we will never have to experience. Truly, Jesus is the Light of the world. Is He your light? By God’s grace may it be so this Easter season! Not Just Permission, but the Privilege to Fail! I know what you might be thinking: Pastor Tommy has lurched past the line of sanity in linking the words “privilege” with failure! I mean, who in their right mind would consider it a privilege to fail at anything?! I encourage you to read on. I think you will find today’s message a great comfort—regardless of where this finds you. There are countless places in Scripture to root this message, but I have chosen the point where Jesus foretells Peter’s denial. In this passage we can clearly see that Peter was not only given the permission to fail, but it was a privilege to do so! Now, I am not suggesting that we go out and do our best to fail in serving our Lord. What I am suggesting is that when we do fail Jesus, we see it as a privilege. Why? Because of the One we are failing! Jesus called Peter into service, knowing from all eternity that Peter would fail. In this narrative we see both the permission and the privilege in our failure. Permission means Jesus knows we are going to fall short of the mark at times . . . many times. Privilege simply means Jesus is the One we are serving, and we should always see it as a privilege to serve Him, whether we are succeed or fail. How often we are like Peter! We resolve to win the day for Christ, no matter what hardship or opposition may come, but along the way we stub our toes and collapse in hopeless defeat. We set out to walk on water, but all too quickly we take our eyes off the Lord and quickly sink into defeat and despair. Our falls do not catch Jesus by surprise. He told Peter exactly what was going to happen before it happened. He is telling us the same thing today. There will be times when we fail. Failure is a part of daily living for broken people living in a broken world. But our failure is never final. Satan asked for Peter but Jesus said no. Final, complete failure is not an option for those who are in Christ. And that is what makes it a privilege to risk for Jesus, regardless of the outcome. You see, the privilege to fail brings with it the grace of forgiveness and permission to try again and again and again. We serve the God of second chances . . . and third chances . . . and so on. The unconditional and eternal love of God removes any dread we might feel about a mistake or a failure. Permission to fail frees to reach and risk—to advance the cause of Christ without constantly looking over our shoulder to see if God is coming after us for past errors. Remember, after Peter’s abject failure—calling down curses on himself in an attempt to convince a servant girl that “I do not know the man”—Jesus restored him to fruitful service . . . but not perfect service! Scripture relates the occasion when Paul rebuked Peter for refusing to eat with Gentile believers because of the disapproving scowls from certain Jews (Galatians 2:11-14). Jesus was not angry with Peter’s failure at that time either, and He did not send Peter away. He urged him and encouraged him to continue to strengthen his brothers. Jesus loved Peter and died for Peter’s sins—all of Peter’s sins, just as He loves you and me and died for all the sins you and I did, do, and will commit. Now that is a comfort we need to be reminded of daily: we don’t only have permission, but the privilege to fail the One who has forgiven every failure. I remember the first time I was given the privilege of preaching from the pulpit. God had called me to the Gospel ministry and I was in the process of completing undergraduate work at Southwest Baptist College. I was privileged to preach God’s Word at my home church. However, many in the congregation could only see me as a “homegrown boy” or “our star athlete.” Some could not get past my past to see me as a minister of the Gospel; their sentiments were essentially expressed as, “I knew you when!” . . . so what gives you the right to . . .?” Some still feel that way sometimes years later. If you have ever encountered someone who could not get past your past after you became a professing Christian, I have some good news for you. I trust that what you are about to read will be as much a source of comfort to you as it has been to me. When someone questions the “right” I have to step into a pulpit and preach the Word of God, they are actually quite correct to be concerned! I have no “right” to do such a high and holy thing. I do not deserve to deliver God’s Word to anyone, except for the grace that God has given to me to do it. Charles Spurgeon, Adrian Rodgers, and W. A. Criswell would have been the first to admit the very same thing about themselves. And the same is true for you, regardless of where this finds you today. Many may question your profession of faith in Christ because they “knew you when . . .” That does not change the fact that God’s grace has sought you and bought you with the precious blood of His Son, and He calls you to do His work in a fallen, broken, and sin-filled world. Some may never get past your past. That’s OK. God got over your past, no matter how wicked and wretched it truly was. God did not wait for you to prove yourself to Him before raising you from death to life. He knew you could never do that anyway! While you were still a self-centered, self-absorbed sinner, Jesus died for your sins. Because God knew us when and still loved us then, that should be enough to keep us going in the face of those who will never be able to get past our past. I can only imagine just how many people who knew Paul when could not get past his past. He was a Pharisee of Pharisees and Public Enemy Number One in the eyes of the early Christian church. He even stood and held the coats of those who stoned Stephen to death. When Paul, now a radically converted believer in Christ, first came to Jerusalem, “He attempted to join the disciples. And they were all afraid of him, for they did not believe that he was a disciple” (Acts 9:26). Yet God’s grace was enough for Paul to get on with the ministry he had been called to. Is it enough for you? None of us deserve anything we have, especially our faith and promised future. So when others say, “I knew you when,” receive it with a heart of thanksgiving for a God who would rescue a sinner like you and give you such an incredible calling to serve Him for His glory and the good of others. The Christian has been saved for service. Notice that I did not say “saved by service.” We are saved by grace through faith in Jesus Christ, and we have been saved for service, not by it. We have been saved by grace through faith; we have been saved from our isolation and saved to community; we have been saved for service. Yesterday was Palm Sunday: the day we remember our Lord’s triumphal entry into Jerusalem, riding on the foal of a donkey . . . knowing full well that His way ultimately led to the cross on Calvary’s Hill. Let’s dwell on this passage for a moment and grab ahold of the overwhelming humility of the Lord Jesus Christ! He didn’t ride into Jerusalem on a nobleman’s stallion or in a conqueror’s chariot. No, Jesus rode on the foal of a donkey, so that the Scriptures would be fulfilled – the Scriptures He wrote (2 Timothy 3:16). And He wrote into the script the most unlikely of animals to carry the King of kings and Lord of lords upon His back. You will remember that the people were filled with excitement and enthusiasm; they made it known to all who were in earshot: “Hosanna to the Son of David!” they cried. “Blessed is He who comes in the name of the Lord” (Matthew 21:9). Hosanna means “save now,” and that is exactly what these people were anticipating: salvation now from the repressive rule of Rome. The people also made their joy known to all those who could see, greeting their King by waving palm branches and laying them as a covering for the path He was riding on. The next day the great crowd that had come for the festival heard that Jesus was on his way to Jerusalem. They took palm branches and went out to meet him, shouting, “Hosanna!” “Blessed is he who comes in the name of the Lord!” “Blessed is the king of Israel!” (John 12:12-13). Palm branches were symbolic of goodness and victory in that day. Revelation 7 describes how people from every nation will raise palm branches to honor Jesus. During Holy Week, the people were waving branches to honor the Messiah, eagerly anticipating a smashing triumph over the hated Roman oppressor . . . not a triumph over sin. They were expecting a political leader and military messiah who would restore Israel to her former glory. They gave absolutely no thought to the notion of a Suffering Servant who would take away the sins of the world, which is exactly what the angels told the shepherds Jesus would do!. Just five days later, when the people realized that Jesus would not be expelling the Roman conqueror, their shouts of praise turned into screams of condemnation: “Crucify Him! Crucify Him!” (Luke 23:21). Before the fresh-cut palm branches had lost their healthy green color, the people were seeking the death of the One who had come to give them life. Jesus was undeterred. He was on a mission, and He would not let anything stand in His way – neither the applause of men nor their condemning cries. He was in the dead center of the will of His Father . . . and in a few days He would be hanging from a cruel cross, beaten and bleeding, gasping out His last agonized breaths. Regardless of where this finds you today as we advance through Passion Week, take some time to reflect on the One who came in unimaginable humility to conquer both sin and death so that you might have eternal life. “For the joy set before Him He endured the cross,” the Bible tells us, “scorning its shame, and sat down at the right hand of the throne of God” (Hebrews 12:2). You’ve probably heard the phrase commonly associated with doctors: “Take two tablets and call me in the morning.” Well I have a phrase for you from the Great Physician: “Take two tablets and call on Me anytime.” The tablets, of course, are the two tablets of the Law of Moses, which represents all of sacred Scripture. And instead of it being our daily medication, it is to become our daily meditation! At First Baptist we encourage our members to read the Bible daily. Many are commenting on how they are getting a clearer picture of the over-all message of the Bible by doing so and the neat experience of how God speaks to them from His Word on the exact day that they need it! This positive feedback is also flooding in from those who have been less than consistent in their reading. They tell me that they are reading more of the Bible this year than they did last year. You know, God could have left it up to the Holy Spirit to inspire, encourage, and motivate us to live the life God is calling us to live without the blessing of the Bible, but He didn’t do that. He gave us His Word so that we would read it, and as I remember a former teacher say . . . THE BOOK YOU DON’T READ…WON’T HELP! So . . . are you being a good patient of the Great Physician and following His prescription for living the Christian life with freedom and joy in the Lord Jesus Christ? Is your life marked by “taking two tablets” and calling on Him regularly? Oh, that it would be truly said of all of us that we could echo the psalmist: “I seek you with all my heart; do not let me stray from your commands” (Psalm 119:10). If you are not currently following a daily Bible reading plan, let me encourage you to begin today. And for those who are concerned about missing some days along the way, don’t be! Life on this side of the grave is not about perfection…it’s simply about progress! Take two tablets and call on Him. You’ll be glad you did.